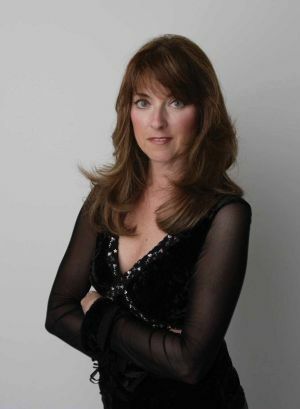 Christine Lavin : JUST ONE ANGEL : DEBI SMITH #10 "From The Hills Of Bethlehem"
Debi Smith "From The Hills Of Bethlehem"
Debi's latest CD, entitled "The Soprano," is a double CD which includes a Christmas album. It is a collection of favorites and originals mainly featuring Debi's soprano voice. This song is from that album. "From The Hills Of Bethlehem"
Our son, Lee, has mild autism, and one Christmas when he was very young we were working especially hard on his "pretend play" skills (children with autism do not generally engage in pretend play, and it is important in a child's development). We discovered he had a thing for armadillos, thanks to a PBS nature special, and he expressed a desire to have one. All that year, we went on a quest for an armadillo of some kind -- preferably not a live one(!) -- to give him as a gift. Finally when I was at the Kerrville Festival in Texas I found a small stuffed armadillo and brought it home. The other thing Lee really wanted at Christmas was a Fischer-Price McDonald's play set. That one was easy! Lee was thrilled with both gifts; however, the greatest gift that Christmas was that many an hour was spent playing with Mr. Armadillo at the Drive-Thru ordering a Hamburger Happy Meal. By the way, Lee is currently working on a degree in Fine Arts. And we still have Mr. Armadillo.